The Summer has come to a close, the nights are slowly drawing in. The heady scent of burning leaves and patchouli fill the air as our minds turn towards the darkness of the coming season. The theme for this hunt is anything dark or Gothic. 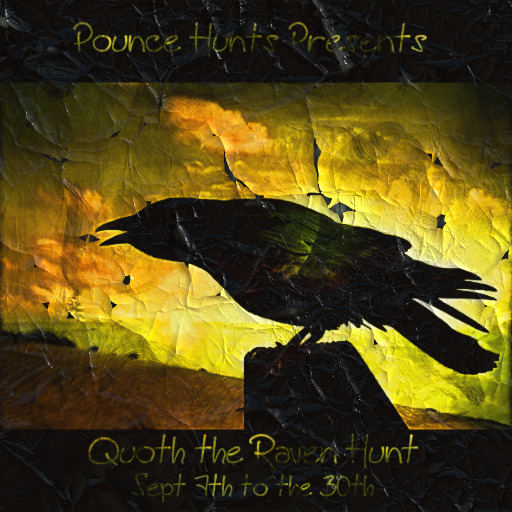 The hunt object is a raven. We are offering up the Nevermore Chair. Mesh build of 11 landimpact with 18 animations for a single avatar. Touch the raven on the stand for a raven sound and touch the wooden raven on the chair for spooky stormy sound. A few new things out for fall including a cute little chimnea and a crow infested pumpkin patch.